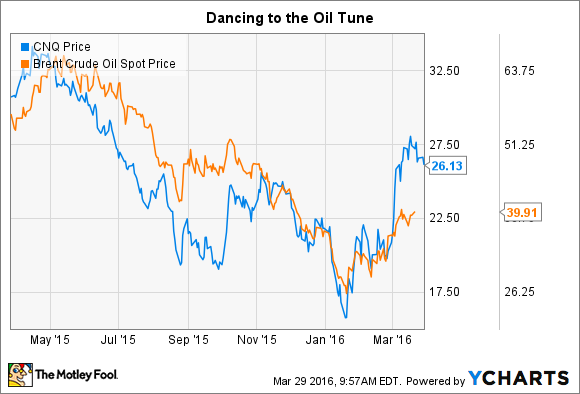 Now is not the time to sell, even if oil starts to falter again. Oil driller Canadian Natural Resources Limited (NYSE: CNQ) has a global footprint, despite having "Canada" in its name. That said, it's a big Canadian development project that should help sustain this oil and gas driller over the long term, even if oil prices remain depressed. Here's what you need to know so you don't make the mistake of dumping a company on the cusp of a big change. Canadian Natural Resources is in the final stages of a big Canadian oil sands project. By the end of 2017, the Horizon project, as the development is known, is expected to add 125,000 barrels of oil per day to the company's production. That will roughly double the company's 2015 oil sands production and increase its overall production by about 15%. In other words, this is a big project. Today that's a problem, because low oil prices have cut into earnings and reduced the amount of cash available to spend on large-scale developments like this. But Canadian Natural is really too far along to stop now. So it's still spending the money. And with operating costs at about $30 per barrel, and a target of $25 per barrel, it's still appears to be a worthwhile project even in today's low price environment. To put some comparable numbers on that, both Suncor Energy (NYSE: SU) and Imperial Oil Ltd. (NYSEMKT: IMO), another pair of well-known oil sands players, have cash costs in the mid-to-high 20's. So Canadian Natural is heading in the right direction, though it still has some catching up to do. But here's the thing: After this project is done, growth spending could, theoretically anyway, drop to zero. While no spending may not be realistic, spending is likely to fall dramatically at the same time that production from the Horizon project is starting to ramp up. So costs will go down, production will go up, and, assuming oil doesn't fall, cash flow should start to strengthen materially. Essentially, Canadian Natural is on the verge of some good things -- it just needs more time to get there. Highly rated, despite the oil downturn. Image source: Canadian Natural Resources. Can Canadian Natural make it to the better days? The answer looks like it will be yes. Long-term debt stands about 36% of the company's capital structure, not unreasonable for a capital-intensive industry. Moreover, debt isn't out of line with its peers, though some do have much lower levels of debt. That said, the company has another $3.4 billion or so in bank lines of credit that it could tap if it had to. For reference, that would be roughly enough to cover the planned spending on the Horizon project. In fact, Canadian Natural is pretty confident that it will be able to cover its dividend and capital spending with cash flow by the end of this year. That projection isn't based on pie-in-the-sky oil estimates, either -- it's assuming $30-per-barrel oil. Helping the company along has been a move to trim operating costs. That's something that all oil companies have been doing, of course. But it doesn't change the benefit that Canadian Natural is feeling. For example, it was able to reduce production costs from a low of 11% in its North American natural gas unit to as much as 24% in its operations in offshore Africa last year. Other segments fell in between those extremes. Add in the fact that many of its properties have very long reserve lives (like Horizon), and the long-term positives here really start to add up. So the worst mistake Canadian Natural Resources Limited investors can make right now is to get caught up in the short-term oil-price gyrations. Yes, low oil is an issue that the company has to contend with, but that's no different from any other commodity-based business. And if history is any guide, oil will eventually rise again, as it has in recent days. In fact, investors appear to recognize the positive impact higher oil prices will have on Canadian Natural Resources and bid the stock up accordingly, as oil has rebounded some. If you see the long-term potential Horizon offers, however, you won't be tempted to jump ship if oil starts to see some downside again. As for the debt issue, once the Horizon spending is complete, Canadian Natural should be able to start paying down debt more aggressively and, perhaps, directing more cash to shareholders. Note that the company has increased its dividend every year for 15 years, so this is a clear focus. In the end, Canadian Natural Resources Limited is far from risk-free, but it also isn't a wildcatter on the verge of insolvency. You may have to suffer through some ups and downs in the stock price, but on a business level the oil company looks to be on solid enough ground to get to the end of the Horizon project. And at that point, Canadian Natural Resources' business prospects start to look far more compelling. Don't get spooked and miss out.